So he is a good lead for the non Jedi Kotor toons. Carth, Z, mission, T3 and Ordo. 4 people that can apply DOTs with potency, tenacity and crit reduction buffed? Z with 90% crit reduction, healing from DOTS and Basic, and an Auto taunt? May not be arena viable but will be a solid team. His lead seems pretty awesome to me. Why do people think its not good? Combo of Phasma and Bossk? Disappointed he is not a scoundrel, but I am rusty on KOTOR. Always viewed him as a Han clone. Doesnt matter, we have 3 scoundrels that applies DoTs and are OR too. GA toon. Bonus points for full health. Assist on top of Mission assist. Yes it's true he is a cool personage and I think he is a Han clon. My last project was the site in https://onlinecasinobox.net/ - Here you can see my Skills. Ok Carth Lead + Zission and Zz + 2 is crazy good. I dont have his lead zetaed yet and dont have Ordo levelled yet but with Jolee and Bastilla as the + 2 people were getting 12 dots stacked on them. This is going to be a top notch defensive team. Adding Ordo will make it truly bonkers. I've got a zeta on his lead. Use him with zission, zalbaar, jolee & canderous. 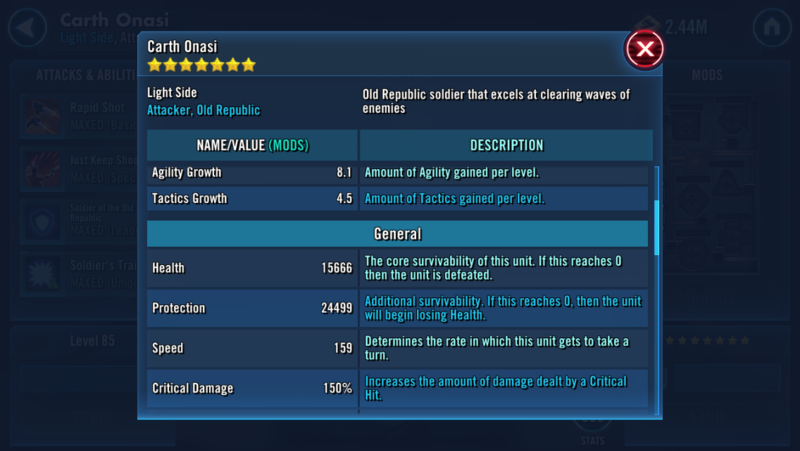 Carth & canderous 3*, zission 6 & other two 7. Record dots 33 on a phoenix team. Great fun. Yeah, carth's lead is my favorite team to use by far. I zeta’d him, and tried using him in arena, but my gear levels were too low. But it’s a really fun team! Carth L, Canderous, zission, zalbaar and Wampa. I want to see how hard wampa can hit in that team. Imagine him hitting Icebreaker with (# of DoTs x 5%) offense on top of the 50% offense he gets w/ protection up. And in this case he would get another 100% because he's facing Rebels. IG-88 could serve as a replacement for Carth here as well. And yes, Canderous' attacks do apply 2 DoTs under that lead. I've played around with IG-88's lead in Pit and had Vader knocking out 20% of the Rancor's health with a single culling blade. Also tried it with zzT3 and had droids hitting for 100k on their basics. Wampa would be a beast in that team, pun intended. I'm just trying to come up with a TW team that surprises people and a g12 zwampa is too much of a warning flag to the opposition! Gamorrean Guard or Bistan are viable as they both apply dots on Basic and are not "red flag" toons. Bistan can reduce TM and takes a lot of turns with frenzy. If you using ig88 lead then farmboy can have a place in the team since he applies dot when he crits on basic. It is his unique that applies dots on enemies, so his aoe is great under zVader. His unique is a little vague, does his stacking offence last for an encounter or entire battle?